Copper Mining: Sacaton, Casa Grande Open Pit Copper Mine, Pinal County, Arizona. Map. 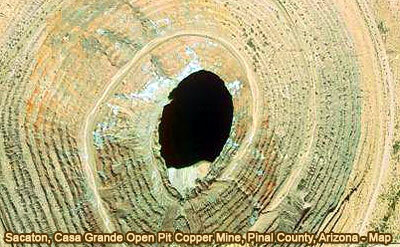 Explore the geometry of the Casa Grande Open Pit Mine, Pinal County, Arizona through detailed Google satellite imagery. To Pan: click and drag the map. Take advantage of the zoom bars. The ASARCO Sacaton mine is an open pit sulfide porphyry copper mine that operated from initial construction in 1972 until March 1984, when it was closed due to depletion of economic ore reserves. The mine is located approximately three air miles west of Casa Grande, Arizona, in Pinal County, and approximately 45 miles south-southeast of Phoenix. Read more.